Looks casual and classy at the same time. 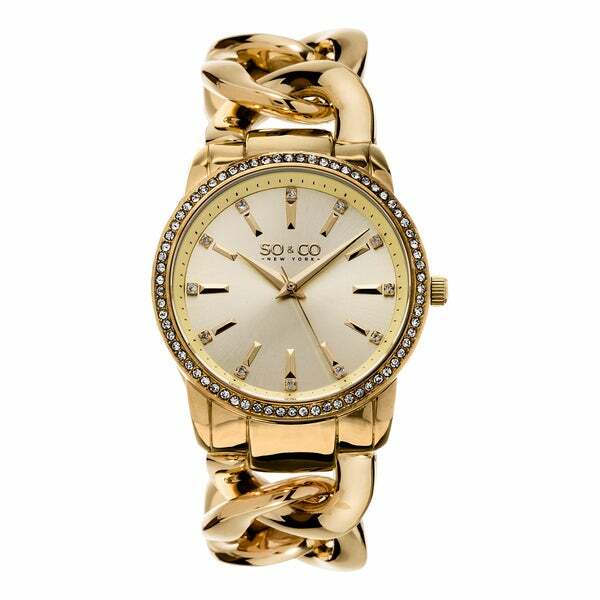 Add an elegant touch to your outfit with this eye-catching SO&CO New York Women's SoHo Quartz Watch featuring a gorgeous goldtone stainless steel bracelet with a fold over clasp accenting a stainless steel case with a push/pull crown. This stylish watch has a reliable quartz movement and a beautiful goldtone dial. I wanted a watch that looked like a bracelet and I could stack bracelets with....this is perfect for that!! This watch was a gift for my beautiful wife, she deserves it very much, this watch has class and looks, the link around it is classy, you do not find most watches with links like this watch, plus it is water proof to 150 feet. it looks great on my wife's hand and she really loves it very much, it is a much bigger watch than the normal woman watches everyone is accustom to, but way worth it, it keeps time very good and very slyest. way worth the money. The watch is absolutely beautiful! Love the watch, was kind hard to figure out, how to open the Bracelet. But finally I did!!! I don't care for the band, links get tristed. returned. fell off my wrist. giant. I knew the face and links would be big but not gigantic! It's a birthday gift for my cousin, & I thought she would like this watch. For my wife, it has elegance and it looks very nice, hopefully it is of good quality.